Setting all musical allusion aside, my first step this evening was to look back over my earlier responses to these prompts: my mini-manifesto, and the story of why I’m keeping the blog-name Just Another Lifestyle Change. Even though I’ve moved on to talk about a wider range of topics than fat acceptance, keeping JALC as my blog-name feels authentic and the appropriate thing to do. For one, I’ve grown ridiculously fond of my little acronym. More substantively, I still see the unconscious patternings around inadequacy, dishonor and not-enoughness as being core to so many of the other cultural patternings I try to unpack and explore. Self-love, in a mature, centered, dignified, joyful way — that’s still the lifestyle change I wish held prominence in the culture. As true today as when I wrote the words 4 months ago. And that’s still true, in terms of the colloquial associations between that term and a certain flavor of self-indulgent introspection — a flavor of “introspection” that can be egocentric and shallow and not really all that introspective once you get down to brass tacks. So no, I do not want this to be a navel-gazing blog. I am, however, feeling a bit more of a pull right now towards bringing both an outward and an inward lens to JALC: the outward lens represented by the sorts of cultural analysis I centered my attention on in September’s manifesto, and the inward lens played out in what I hope will be more authentically (rigorously?) introspective writing about how I bring my ongoing studies to my lived experience and to the dual endeavor of fully loving the love I have and also simultaneously working to design that life forward to be ever-closer in alignment to my heart’s true nature. Fully embracing what is even as I strive towards something “better,” designing and building my ship even while I’m out on the open sea….. The phrase is an attempt to take that longer-winded metaphor about designing and building my ship and compress it into something evocative. I may continue to tinker with it as the days go by. 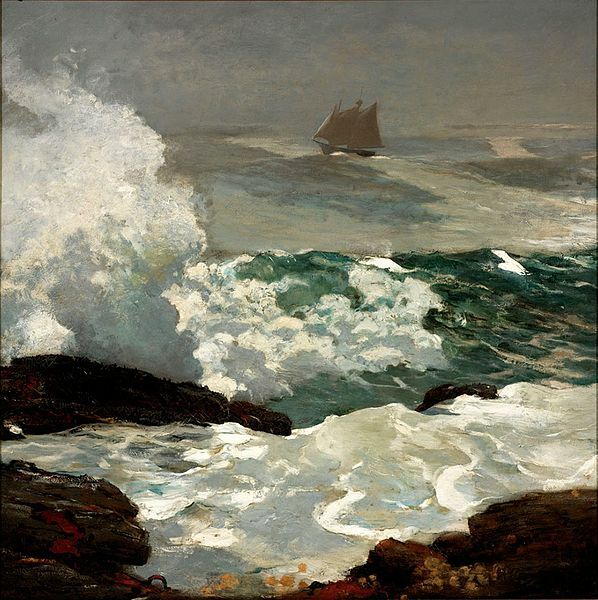 Image credit: Winslow Homer, On a Lee Shore. Unaltered. Public domain. I love your title and look forward to reading more of your posts, whether or not you gaze at your navel, for you write well. Reminds me of the central challenge of DBT: believing both that you are fine just as you are AND that you need to (and want to) change. As a long-term, card-carrying member of the Introspectively Bloggy Bloggers Association myself, I look forward to reading where this new direction leads you!